I recently needed new tires (don’t even look at the tread…it was bad)! 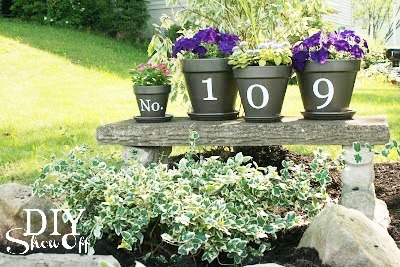 This is a great idea for upcycling! The July Challenge for Lowe’s Creative Ideas is Outdoor Art so I headed to Lowe’s for some supplies. There on the wall? Isn’t it happy? 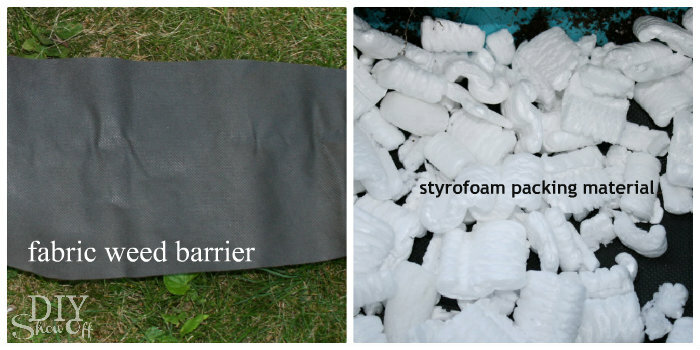 I already had some leftover fabric weed barrier from the pallet herb garden and some packing peanuts on hand. I gave the tire a good scrubbing with soap and water and let it dry. Then gave it a couple of coats of spray paint (paint + primer). Let dry. 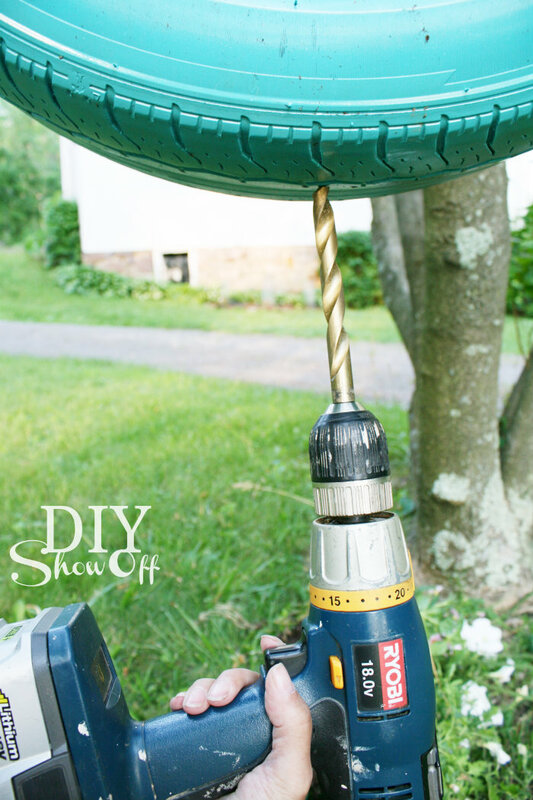 Next we used a (correction) 1/2 inch drill bit to drill 6 holes into the ‘bottom’ of the tire for drainage. This takes a sharp bit and a lot of pressure (as in I tried but had to have my husband take over). It also produces a little smoke. Then lined the bottom with a piece of fabric weed barrier and a few styrofoam packing peanuts. 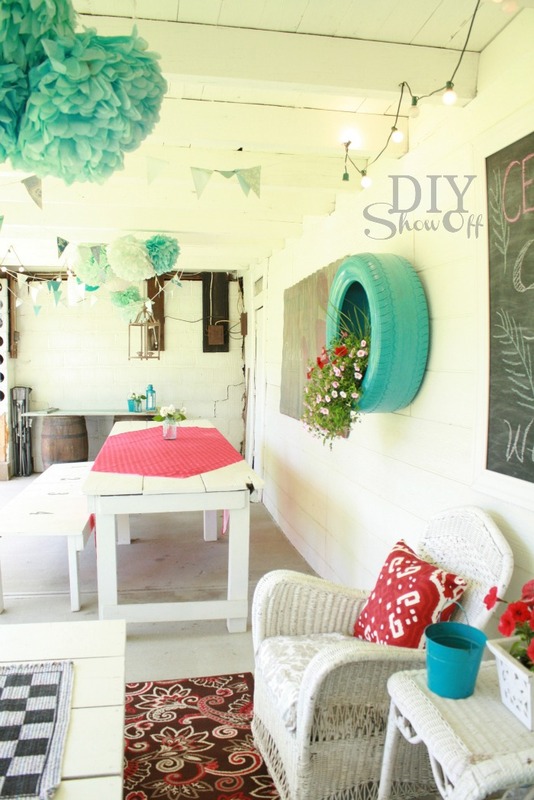 When we’re entertaining, I move the wall mounted tire flower planter to the interior wall of our covered patio. It’s simply hanging on a big humungous sturdy nail. 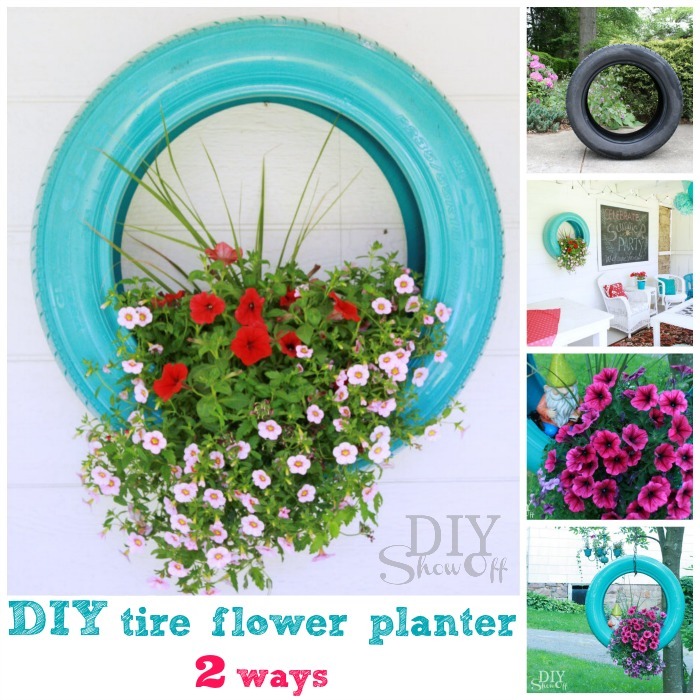 When the party ends, the tire planter is moved to an exterior wall for sunshine and rain/watering. It’s awkward but not too heavy or difficult for moving around to maintain. 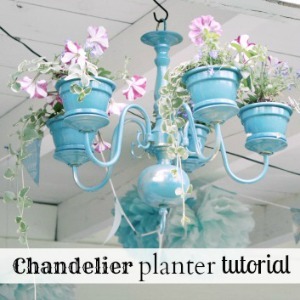 Doesn’t it look beautiful hanging with my DIY chandelier flower planter in the background? To hang from a tree: Use chain (double hanging length, add about 10″ for in the tire and more for the size of your tree limb). 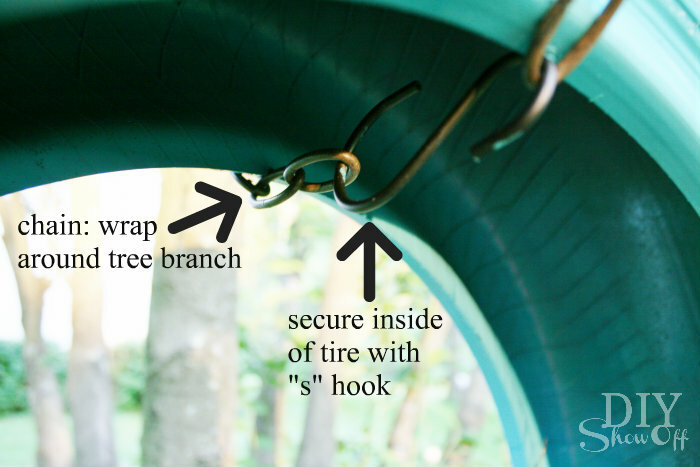 Wrap chain around tree branch and secure end pieces inside of the tire with an “s” hook. *After I stood back and admired my completed project, I decided to see if it had been done before and of course! You can see this idea at Recaptured Charm too. Sharing at So You Think You’re Crafty. *Disclaimer: As a member of the Lowe’s Creative Ideas Creators and Influencers network, I received a Lowe’s gift card to complete this project. The tutorial images, instructions and opinions are my own. DIY results may vary. 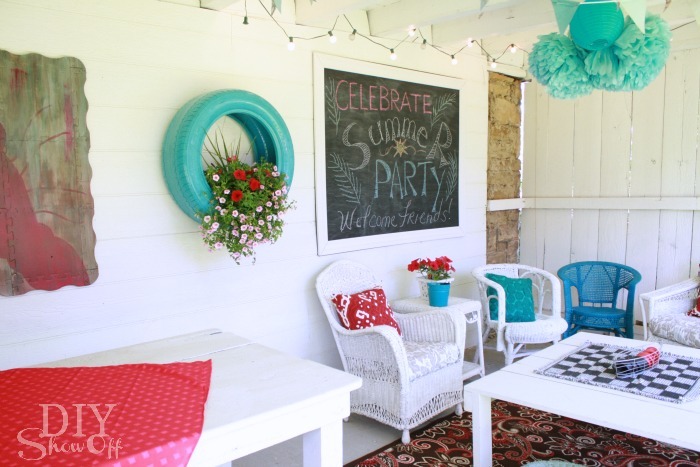 This entry was posted in Favorite, Lowe's Creative Ideas, Outdoor Areas, Patio Accents, Roeshel's Projects, Summer, Thrifty Treasures and tagged ad, DIY, Lowescreator, Outdoor Decor, planter, repurpose, Thrifty Treasures by Roeshel. Bookmark the permalink. I lined the bottom with the fabric weed barrier then added a few styrofoam peanuts on top just to help with drainage. This is so cute! I especially love it hanging from the tree! Oh I love them. 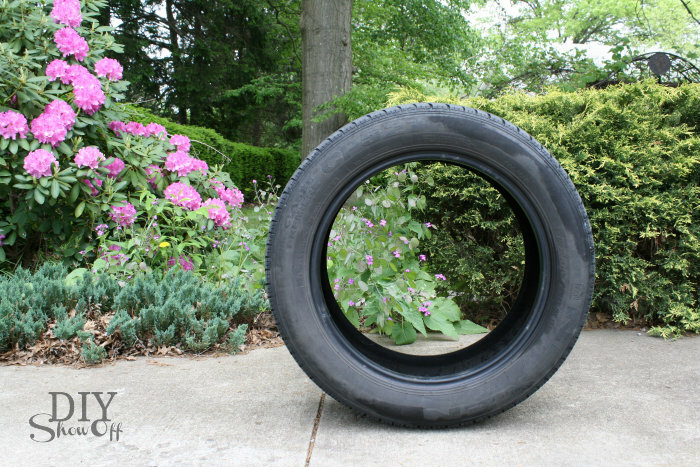 I wish I had known about this a few years ago when a neighbor put some tires out on the curb. Love the colors too. I love this project! I am going to try and make one or 5. So pretty! I love it, so bright and cheery! I actually made a couple of tire planters last year but never thought to paint them, I really think that makes it look so much better… as opposed to a white trash chick who can’t afford a real planter! LOL! I apologize, Tomasena. I will edit the post right now because I just checked and you are in fact right, it’s a 1/2 inch drill bit. I’m so sorry! Are you able to use wire cutters to remove any sharp steel? and if it was me, I would probably Just spray paint over the exposed steel to blend in (the bottom of the tire doesn’t seem to be very visible). I hope that helps and I apologize for the error! Thank you so much for taking the time to let me know to make a correction in the instructions. Superbly cute – what a wonderful upcycle! Very clever idea! It looks GORGEOUS! Your site is very nice, with lots of great ideas. If I may, I’d like to make a suggestion. 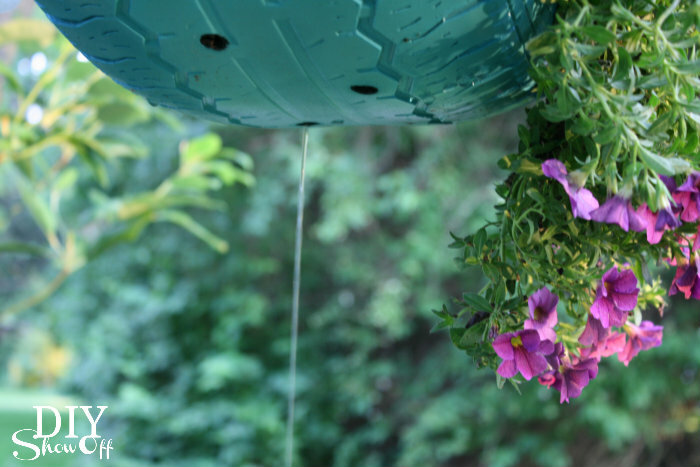 The chain for hanging that beautiful tire with the flowers spilling out of it, one could slide a bit of plastic or rubber hose on the part of the chain that touches the tree, this would protect the tree from any wounds that could eventually kill your lovely tree. How come you use the styrofoam packing peanuts? So you would put the weed barrier down first and then soil on top of the peanuts? Love it!!! Making one as we speak. Awesome, Rita! I’d love to see it when you’re done, if you wouldn’t mind sharing a picture! Thanks so much for stopping by and letting me know! Makes my day! that tire just looks perfect and lovely. i would definitely try it. btw, why did you use the styrofoam packing peanuts? and is it compulsory to put fabric weed barrier? Thanks, Cku! I used the styrofoam packing peanuts for extra drainage (not necessary) and I used the fabric weed barrier so that the dirt didn’t drain out of the drainage holes. Again, both things are completely optional. I really love the idea of the tire hanging as such. It is so very creative and so much nicer than the ones of decades ago where they laid the tire on the ground and put flowers inside. 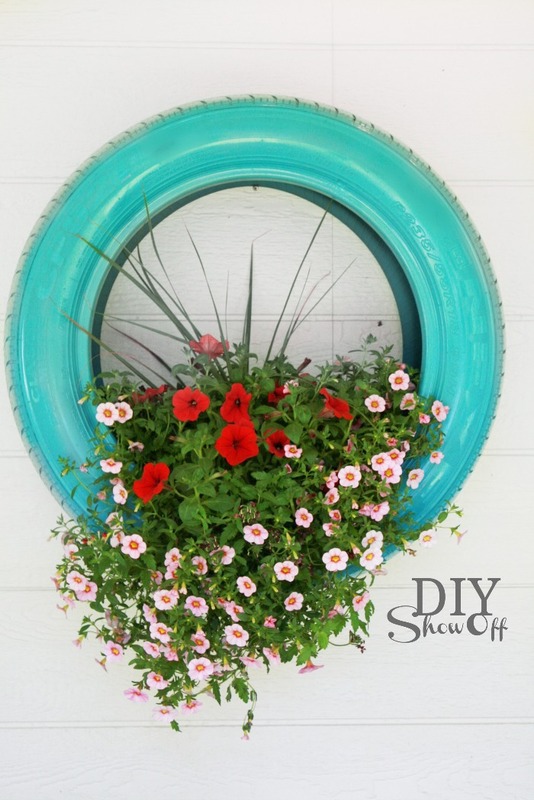 I used an old garden hose for a wreath for my shed, it was an old hose so I could cut it to not make it too heavy to hang. 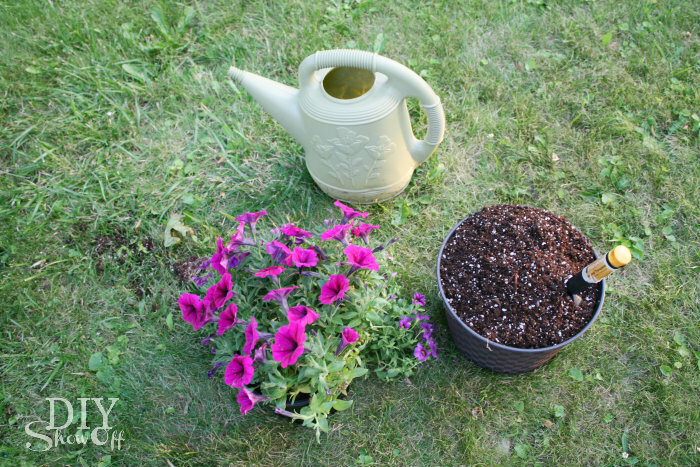 Then I like it enough to buy a cheap hose at the dollar stores & I used silk flowers as it was easy to tie them to the hose with some gardening gloves & an old hand garden tool. But I did want to ask, what type of paint did you use for the tire? Thanks for sharing and congrats on winning the gift card. 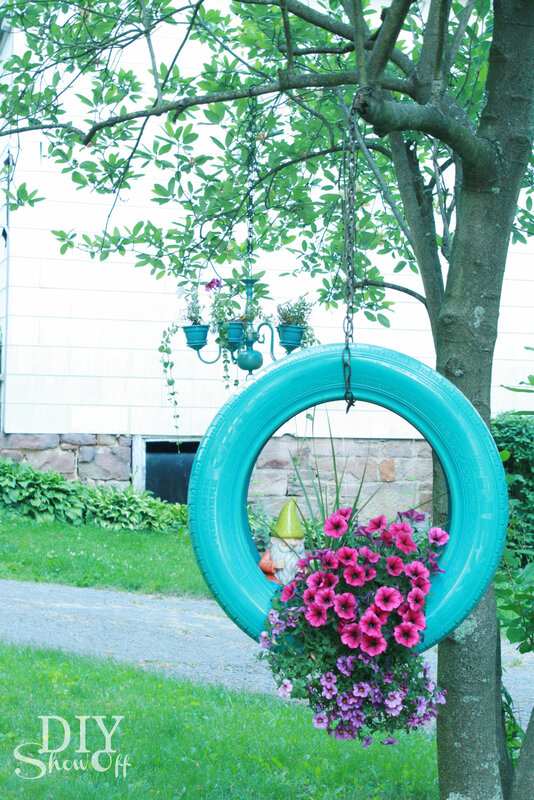 I have 3 tires – one is to make a swing and 2 for planters – I would never in a million years thought to hang it vertically – thanks so much for sharing this – it’s fabulous ! Just completed this project. One addition: I used a Goodyear tire and covered the raised lettering with petroleum jelly using my fingers and a small stiff bristled paint brush prior to painting. The paint came off the lettering easily and the result looks so neat! Thanks for the tutorial! 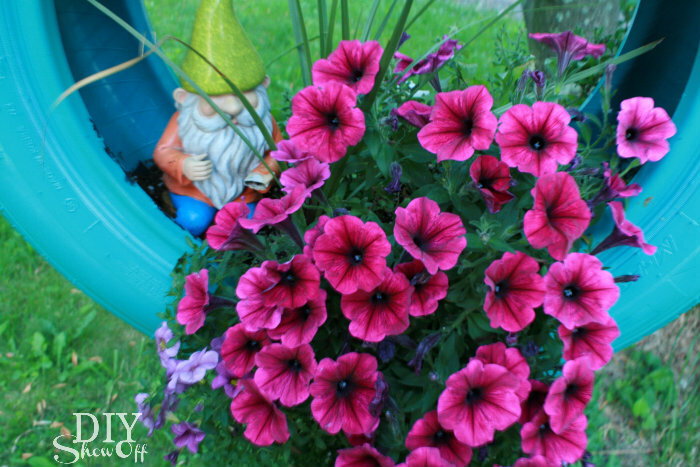 that gnome just makes that planter.really cute. 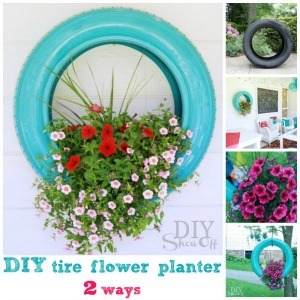 Hi – I want to ask you if I can use the picture of this great tire flower planter in an article? I will of course link directly to your site. I would be honored, Rikke. Thank you! Wow-this is so cool. I love this so much I’m gonna share it with my sister in law(she’s pretty crafty herself I must say) and I know she’ll also wanna do some ourselves. The color that u used is fantastic. Thx?????????? Hi, love this idea. Please I could use this in a roundup with link and one image? Hi Medina, Yes, of course! I would be honored. Thank you! I used an outdoor spray paint. Try putting an eye bolt in the tire. Hook the chain to the eye bolt instead of wrapping around the tire. My tire is attached to the pergola with eye bolt and hook, no chain. Thanks for your sharing,its great. Thank you. Just came across this article and Someone was nice enough to leave a used tire in the back yard. Mine will be a bright orange to hang out front. Have u had issues with fading? I attempted this earlier in the year and since my tire is almost back to black. Was wondering if there is any good way to seal the tire from absorbing paint or keep from sunfading. I’ve had it hanging for the past couple of years (through winters too) and mine has not faded yet. 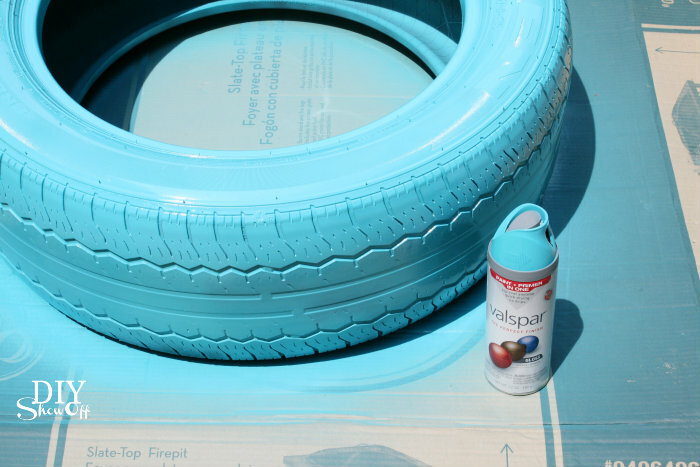 I used a Valspar spray paint (rated for outdoors)…did you use something along the same lines? Or perhaps tires are made differently? 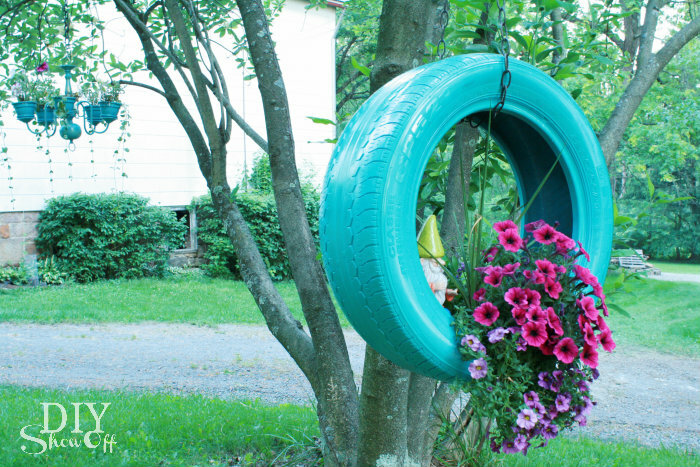 Love, love, love the tire planters – both the wall hanger and the tire swing. Painting the tire such a lovely color makes it stand out and showcase the flowers even more. I want one, or two, or…………….. Thanks, Paula and I apologize! I have no idea! 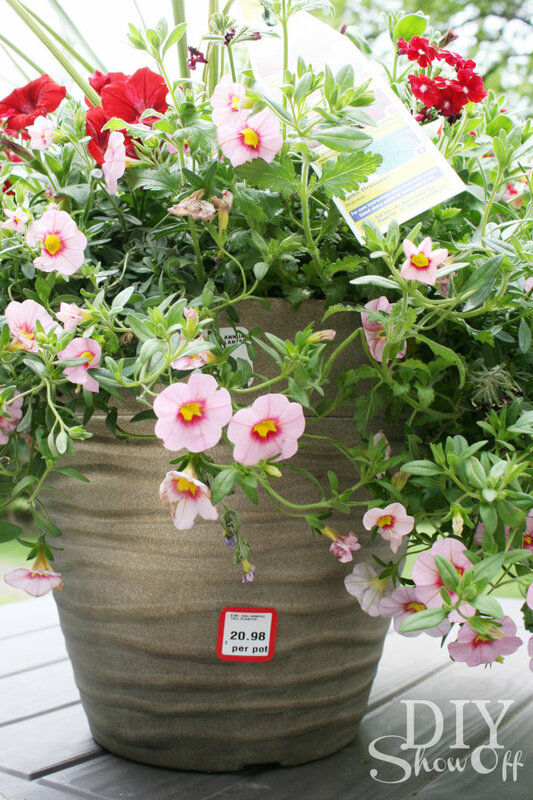 I think that even though they were small, my guess is that they were still a petunia variety. I’m sorry I can’t be more helpful.